Gov. Mike Dunleavy’s Monday visit to Ketchikan included a 90-minute question-and-answer session with residents. Outside about 30 demonstrators picketed the venue. One of the picketers standing in the cold and blowing rain was Frankie Urquhart. Her handmade sign read: Fund Our Future. Inside the Sunny Point Conference Center, about 150 attended the lunch event hosted by the Ketchikan Chamber of Commerce. The governor started with a history lesson. When considering inflation, the value of that mid-1960s budget number would be about $1.4 billion today. Alaska’s current population has almost tripled since then. Dunleavy told the Chamber audience that as Alaska gained oil wealth, spending has increased at an unsustainable rate. That, he said, is why the state now faces a deficit. Dunleavy said his proposed budget addresses the problem from a spending perspective rather than a revenue perspective. That means big budget cuts. The governor’s presentation took about half an hour. After that, he took questions from the audience. 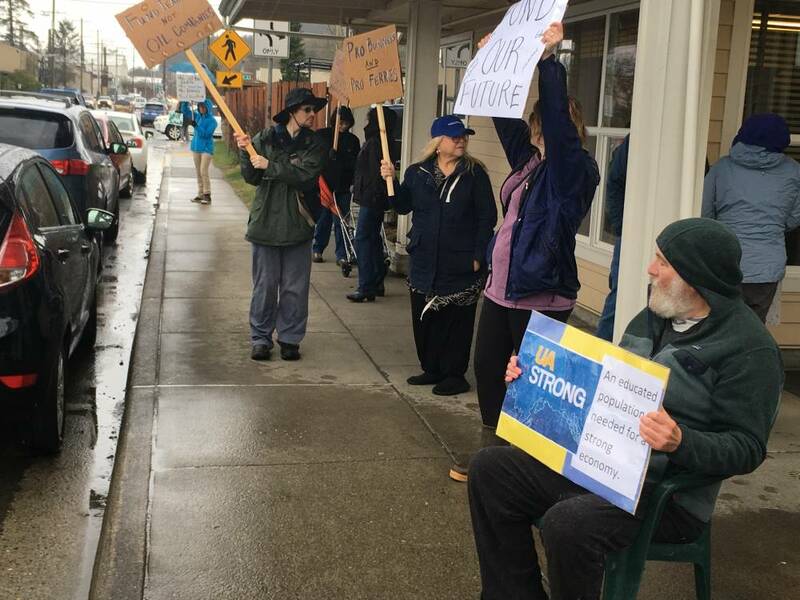 Kim Hodne, who volunteered for Dunleavy’s campaign in Ketchikan, said that Dunleavy’s proposed budget is dividing the state into winners and losers: with huge cuts from the ferry system and education. 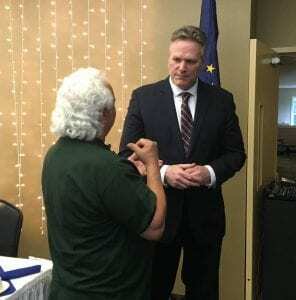 Dunleavy responded that he’s not trying to divide the state; his administration is targeting the state’s largest expenses. He said more spending hasn’t improved outcomes, and he wants to change the pattern in state government by bringing a new perspective. We will have a follow up report with more details from the governor’s presentation, and questions from audience members.